Details : Ht 26" DIP. Ev. E-M. Re. Bl 5"
Pretty blend of pink and purple with a large ashes of roses watermark. Blooms practically all summer long! Details : Ht 30" TET. Mid. EEv. Re. Bl 5.5"
Rose violet with a blue lavender eye and double edges of blue lavender and edges trimmed in white. Limited stock - 1 per customer. Details : 24" SEv. Tet. M Re. Bl 6"
A dark purple with a pale pink watermark above a green throat. Rounded with a silvery edge. Limited supplies - 1 per customer. Details : 30" Ev. Tet. E-M. Re. Bloom 5"
Details : Ht 24" Dip Ev. Early Re. Bl 4.5"
Dark purple double with green throat. Details : 26" Tet. Ev. M. Re. Bl. 5"
A silvery mauve with a raisin-plum eye and a chartreuse-yellow throat. Colourful. Details : 29" SEv. Tet. M. Re. Bl. 6"
A beautiful dark clear purple with a silver-white bubbly edge. Limited stock, 1 per customer. Details : 25" Ev. Tet. E - M. Hyb. Bloom 6"
A grape-purple with white sharks tooth edge, lighter grape-purple watermark and a chartreuse halo. Limited stock. Details : Ht 28" DIP. Dorm. M Re. Bl 5½"
Details : 24" Ev. Tet. E-M. Re. Bl. 6.5"
Large clear blue purple self. Very flat, heavy substance with a dark green throat. Unique. A favourite. Limited stock - 1 per customer. Violet purple with white midribs, green throat. Rounded ruffled piecrust edgeing. A colour gem. Vigorous and Robust. Details : Ht 22" DIP. Ev E Re. 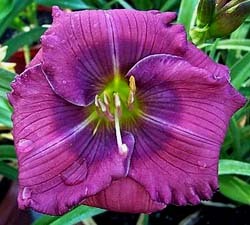 Bl 4"
Consistently full double blooms of violet purple with a darker eye & a tiny green throat. Details : 13" Ev. Dip. M. Re. Bl 3.25"
Small lilac pink blooms of exquisite colour. Many blooms. A nice display at peak blooming. Details : Ht 28" TET. Ev. E-E Re. Bl 6.5"
Clear royal purple blend with a deeper shadowed eye and edge. Limited stock - 1 per customer. Details : 20" Ev. Tet. E-M. Re. Bloom 5"
A large creamy eye extends way out into this silvery mauve with a plum violet eye. Details : 24" SEv. Tet. E-M Re. Bl 5"
A rich royal purple with a chalky red-purple eye above a striking green throat. Form is full. Lovely. Details : Ht 31" Dip. Ev. M. Unusual Form Bl. 9.5"
An U.F. 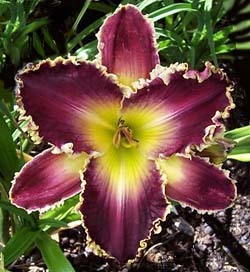 attractive dark purple burgundy bloom on tall scapes. Blooms have a creamy white eyezone and midribs, large green throat. Showy. Details : Ht 32" TET. M. SEV Re. 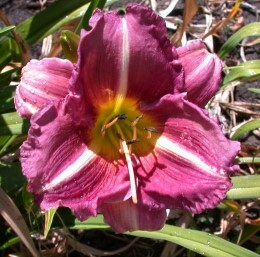 Bl 5.5"
A deep purple color with a lime throat and a small white and gold petal edge. This flower is narrow and a bit spidery looking. Limited Stock. Details : 26" SEv. Tet. M. Bloom 6"
A dark royal purple bloom with a large cream-yellow green centre extending out onto the petals. 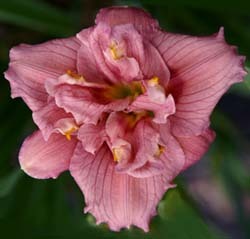 Petals sometimes can slightly twist - U.F (unusual form). Details : 30" SEv. Tet. M - L. Bloom 6"
Violet-purple with a dark purple eye and yellow throat. Vigourous. Details : 32" Ev. Tet E Re. Bl 9"
True purple with a hint of rose. Big yellow green eye. Limited stock - 1 per customer. A medium purple with a large chartreuse throat.